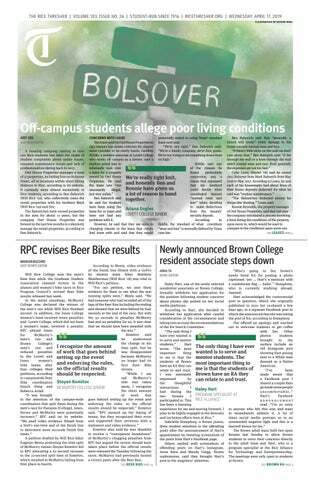 A resolution to secure on-campus housing for first-year transfer students at Rice University was introduced at the Oct. 21 Student Senate meeting and amended Oct. 28 to further recommend increased resources to aid transfer students in making the transition to Rice (see story, p. 1). The Thresher supports this resolution and encourages the Student Senate to approve it. The residential college system is a significant aspect of Rice's culture and is often a deciding factor in students' choice to transfer to Rice. Current housing rules, however, do not guarantee on-campus housing for first-year transfer students. This is problematic for transfer students, who may already feel outside of the Rice community, because being off-campus their first year at Rice severely limits their opportunities for residential college participation and interaction. There are always exceptions and those who put extra effort into becoming part of their college culture, but in general, living off campus hinders transfer students' ability to adapt to the Rice community. A survey conducted by Rice Transfer Student Association President Ryan Kim has shown that a significant portion of transfer students who must live off campus their first year at Rice do not move on campus later on. No matter the effort put in by students, being off campus does interfere with college-oriented activities and can restrict the amount of student interactions people have. This is especially true of colleges with strong floor culture, where those transfer students who remain off campus never become part of this culture. Rice students take great pride in the residential college system and the inclusivity it offers to all of its students, yet transfer students are still left in the margins. Despite not being "new" university students, transfer students are new to Rice and should be given the same privileges as all new students. Unsigned editorials represent the majority opinion of the Thresher editorial staff. All other opinion pieces represent solely the opinion of the piece's author.